As a devastating dry period threatens the future of NSW farm land, the work of Slow Food Volunteers in the Hunter Valley region is being championed for the support that it is providing to local producers. Victims of an unrelenting drought, farmers are facing the risk of not having enough fresh produce to continue working or worse, being forced off their land. Last week, Meryl Swanson MP, Federal Member for Paterson, rose in Parliament and highlighted* the work of Slow Food Hunter Valley (New South Wales) and the Slow Food Maitland Earth Market and the measures taken to help local drought-affected farmers. The speech was in response to an Appropriations Bill and Ms Swanson was listing the best ways that the farming community could be supported for the $1.5million appropriation required by the Turnbull Government. Slow Food Hunter Valley was funded with the aim of helping and assisting local farmers who still produce local food varieties following the Slow Food philosophy of good, clean and fair. Today, more than ever, farmers need all the support that they can get in order to overcome this drought, the severity of which has been emphasized by the Bureau of Meteorology declaring this January as the driest since 1932. Slow Food volunteers and Amorelle Dempster, leader of the local chapter, have carried out several activities to support local production during recent years. Humble pumpkin: in 2016 Slow Food Hunter Valley rescued acres of pumpkins that were destined to become fertilizer. The pumpkins were gathered by volunteers and sold at a pop-up pumpkin stall in the Levee on Maitland’s main street. 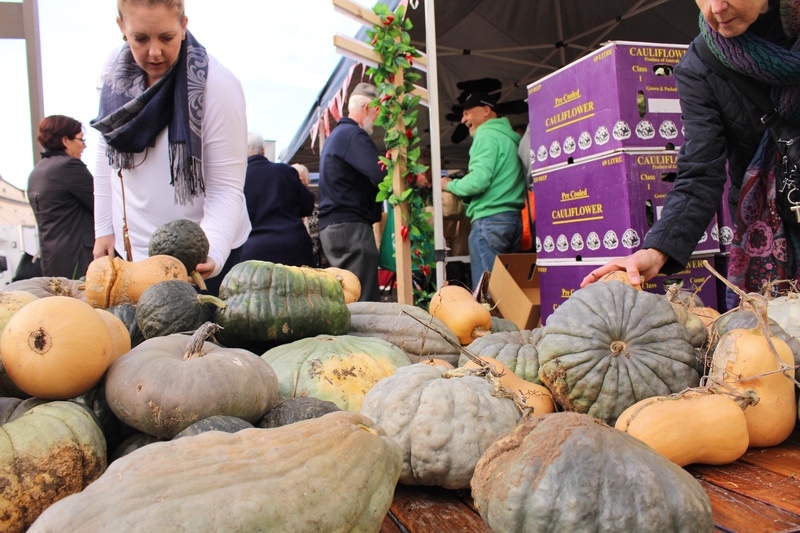 The participation of local farmers, the support of Maitland City Council, the reaction of the media and the amazing response of locals meant hundreds of tonnes of pumpkins did not go to waste. Maitland Earth Market: the first Australian market to join the international project of Slow Food Earth Markets. The participants at the Australian Earth Market guarantee that their produce is good – high quality, fresh and seasonal; clean – made from local crops, free of GMOs and environmentally sustainable; and fair – offering accessible prices to consumers and fair compensation and conditions for producers. The market is held at the Levee shopping precinct every first and third Thursday of each month. Community meals: Amorelle Dempster, 2017 Maitland Citizen of the Year, made her cafe kitchen available to Slow Food volunteers, who help her cook community meals for the disadvantaged, using donated excess produce. Each week, around 25 volunteer hours are clocked up creating around 200 nutritious meals from fresh food brought into the cafe by farmers. In one-year, Slow Food volunteers turned 704 kg of fresh food into nutritional meals. *See below the section of Ms Swanson’s speech which mentions the work of Slow Food. To see her full speech, you can click here.